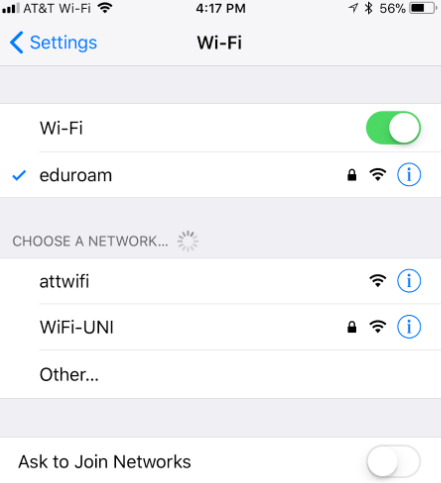 The eduroam network is UNI's wifi network for current UNI students, faculty, and staff. Guests can access UNI's Guest WiFi network. Below are instructions to help you connect your device. If you have a wired device on the residential network, check out our instructions for connecting. Open the network icon in the lower-right corner of your screen. 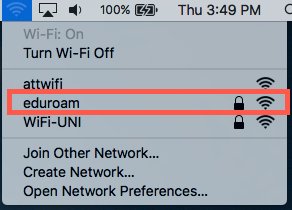 Find the eduroam SSID and choose it. You will see a prompt to connect. Make sure Connect automatically is checked and choose Connect. You will see a prompt to accept a security certificate and choose Connect. Enter your CatID username followed by @uni.edu. 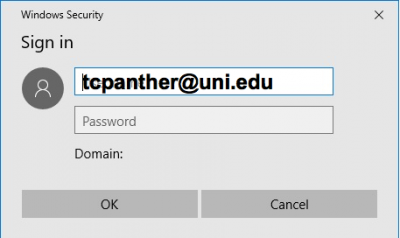 Example: tcpanther@uni.edu. Then enter your passphrase and choose OK. 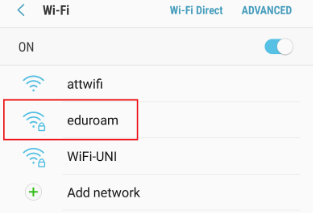 Choose the wifi icon in the top-right of the screen and choose the eduroam network. You will be prompted to enter your CatID username followed by @uni.edu. Example: tcpanther@uni.edu. Then enter your passphrase and choose Join. Make sure your wifi is turned on and open up the wifi networks. 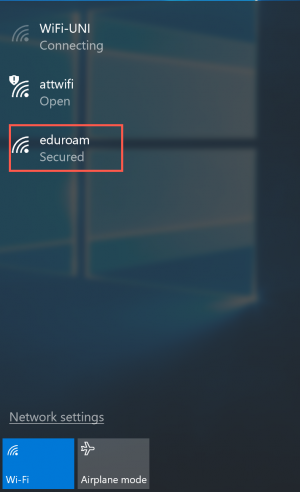 Tap on eduroam to connect. 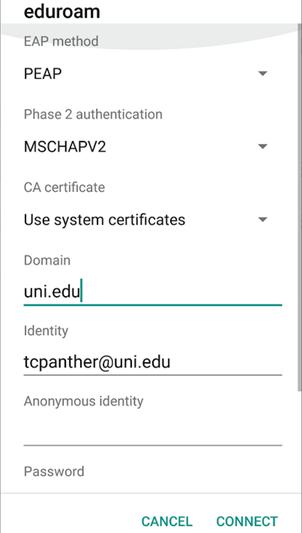 Enter your CatID username in the Identity field followed by @uni.edu. Example: tcpanther@uni.edu. Scroll down to the password field, enter your passphrase, and choose Connect. Open up Settings and choose Wi-Fi. Enter your CatID username followed by @uni.edu. Example: tcpanther@uni.edu. Then enter your passphrase and choose Join. 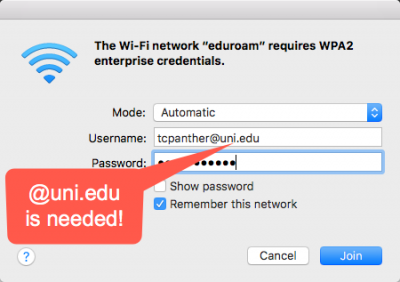 To work on eduroam, devices must support WPA-Enterprise (not just WPA-Personal) encryption. Below is list of all the incompatible wireless devices on eduroam. Some of the below devices work through a wired connection on the ResNet network. 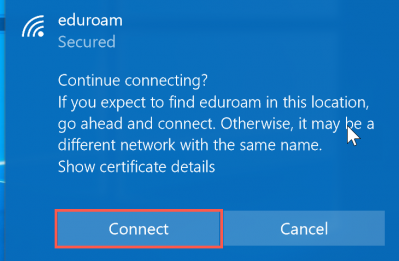 Try Forgetting the eduroam network and then reconnecting. 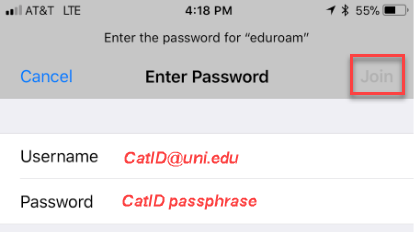 Make sure your CatID username and password are entered correctly. You can test this out on another device with internet access by logging into the myUNIverse portal. Devices should have their networking settings set to automatic. The date and time set correctly on your device. If you're still having problems, contact the IT Service Desk.